Home Beers Urban Family Brewing Co.
Imagined History | Urban Family Brewing Co.
Wild farmhouse ale brewed with squash, hay and spices. Poured a sample into a small tulip glass. A cloudy, golden/amber color. Swirling bubbles in the middle keeps a low-lying white foam cover active. You can really smell the spices. Some sweet and tangy fruits and wild honey mixed in from the funky belgian yeast. Squash and hay.....you can actually smell those as well. Overall, very sweet and funky. The mouthfeel is very clean, smooth middle and a slightly dry finish. The flavors are indeed, very wild. Hay, wheat and grains, big time spices and tangy hops. Wild, funky fruity yeast makes this really complex. The squash and hay additions thicken the mouthfeel and add a level of smoothness. A mead type sweetness rounded out by earthy tones has an equally as wild balance. A strange but unique take on the ever evolving Farmhouse style. According to the label, this is "brewed with squash, hay, and spices." Got my attention. Color is an interesting clear orange, like they used Hubbard squash. A nice veil of foam in the Affligem chalice. Flavor is really quite pleasant and rich, even. It tastes like the farm kitchen and smells like the compost heap, in a nice way. Starts out warm and malty. Fruity, wheaty, and a little tartness in the finish. Dry Belgian yeasty aftertaste. This is one of a couple of my favorites from Urban Family. It's great to taste how much interest and variation you can get from the basic Belgian Farmhouse recipe. From the 500 ml bottle purchased at Community Co-op in Bellingham. Aroma is complex spices and malts. The flavor is complex spices, mild bubblegum, malts, fruit/berries and a mix of sour and tart/slightly sweet in the finish. 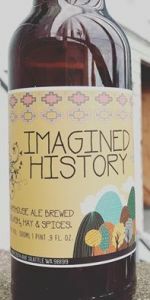 Imagined History from Urban Family Brewing Co.